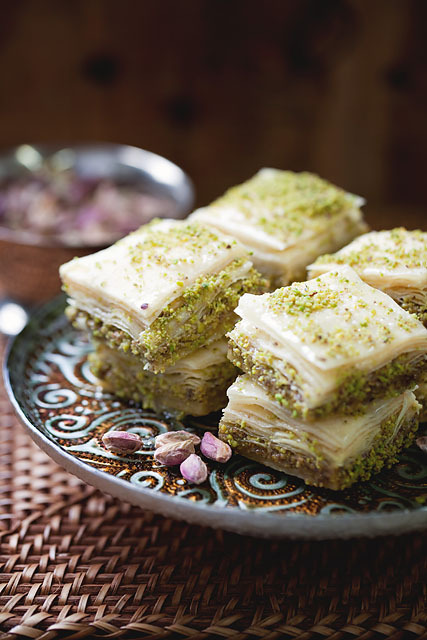 Ingredients - Syrian Baklava and Pistachio Rolls: Green pistachios, unbleached hard wheat flour (malted barley, niacin, reduced iron, thiamine mononitrate, riboflavin, folic acid), sugar, water, ghee (clarified butter), corn starch, distilled natural flavors, salt, and citric acid. Cashew Bundles: Cashews, unbleached hard wheat flour (malted barley, niacin, reduced iron, thiamine mononitrate, riboflavin, folic acid), sugar, water, ghee (clarified butter), corn starch, distilled natural flavors, salt, and citric acid. Cashew Sticks & Bracelets: Unbleached hard wheat flour (malted barley, niacin, reduced iron, thiamine mononitrate, riboflavin, folic acid), cashews, sugar, water, ghee (clarified butter), corn starch, distilled natural flavors, salt, and citric acid. Cashew Sticks: Unbleached hard wheat flour (malted barley, niacin, reduced iron, thiamine mononitrate, riboflavin, folic acid), cashews, sugar, water, ghee (clarified butter), corn starch, distilled natural flavors, salt, and citric acid. 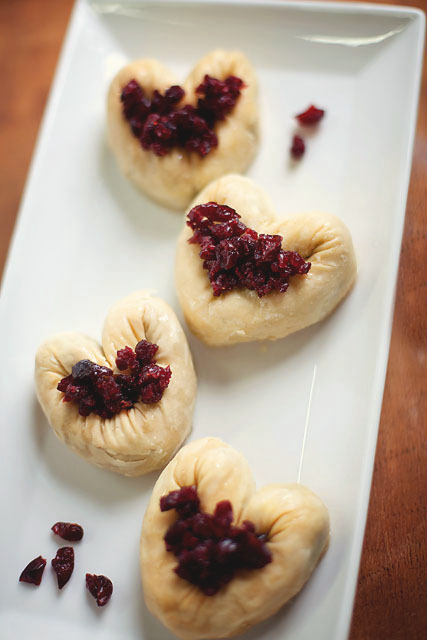 Delicate confections filled with smooth, rich dates or sweet, crispy ground pistachios. Ingredients - Date Cookies: Unbleached hard wheat flour (malted barley, niacin, reduced iron, thiamine mononitrate, riboflavin, folic acid), ghee (clarified butter), dates, sugar, water, distilled natural flavors, powdered sugar, and yeast. Pistachio Cookies: Unbleached hard wheat flour (malted barley, niacin, reduced iron, thiamine mononitrate, riboflavin, folic acid), ghee (clarified butter), pistachios, sugar, water, distilled natural flavors, powdered sugar, yeast, and citric acid. Contains: Wheat and Tree Nuts. Made in a facility that uses milk, peanuts, soy, and eggs. Ingredients - Green pistachios, unbleached hard wheat flour (malted barley, niacin, reduced iron, thiamine mononitrate, riboflavin, folic acid), sugar, water, ghee (clarified butter), corn starch, distilled natural flavors, cornmeal, salt, and citric acid. Ingredients - Unbleached hard wheat flour (malted barley, niacin, reduced iron, thiamine mononitrate, riboflavin, folic acid), cashews, sugar, water, ghee (clarified butter), corn starch, distilled natural flavors, cornmeal, salt, and citric acid. Ingredients - Cranberries, unbleached hard wheat flour (malted barley, niacin, reduced iron, thiamine mononitrate, riboflavin, folic acid), sugar, water, ghee (clarified butter), corn starch, distilled natural flavors, cornmeal, salt, and citric acid.